Mercedes-Benz coupé in the C 123 (1977 to 1985) model series. Photograph dated 1980. The cutting-edge technology and elegance characteristic of Mercedes-Benz have always been expressed in a very special way in coupés. 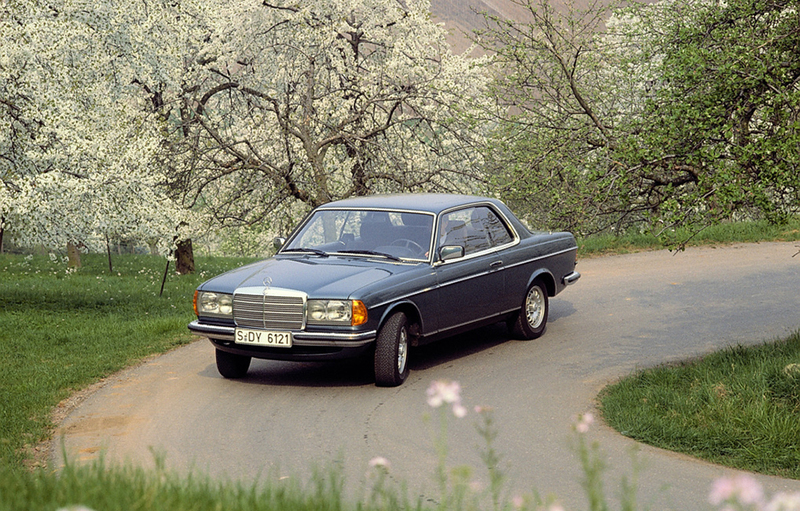 The three 230 C, 280 C and 280 CE models, presented by Mercedes-Benz 40 years ago in March 1977 at the Geneva Motor Show, linked into this tradition. Today the model series C 123 is embedded in the history of the E-Class Coupés. The latest example of this is the model unveiled in January 2017 at the Detroit Motor Show, the new E-Class Coupé: It interprets its history in a highly contemporary fashion and with special sporty elegance. Today these statements are as current as back then. For the coupés from model series C 123 are among the popular young classics from Mercedes-Benz. This is why they are also part of the fixed offer from ALL TIME STARS, the vehicle trade section of the Mercedes-Benz Museum. Mercedes-Benz coupé in the C 123 (1977 to 1985) model series. Photo from 1981. Some body details corresponded to the superior design on the 280 and 280 E saloons. All three coupé models had rectangular broad-band headlamps, chromed air inlet grilles in front of the windscreen and chrome trim beneath the rear lamps. As of the facelift in September 1982 the air inlet grilles were in black. An important technical improvement compared with the direct predecessors of the “Stroke Eight” model series (W 114) was the even more stable safety passenger cell with a stiffer roof frame structure, high-strength roof pillar and reinforced doors. The energy absorption of the front and rear crumple zone was significantly increased through the controlled deformation capability of the front end and rear area. A further safety innovation came in August 1980. 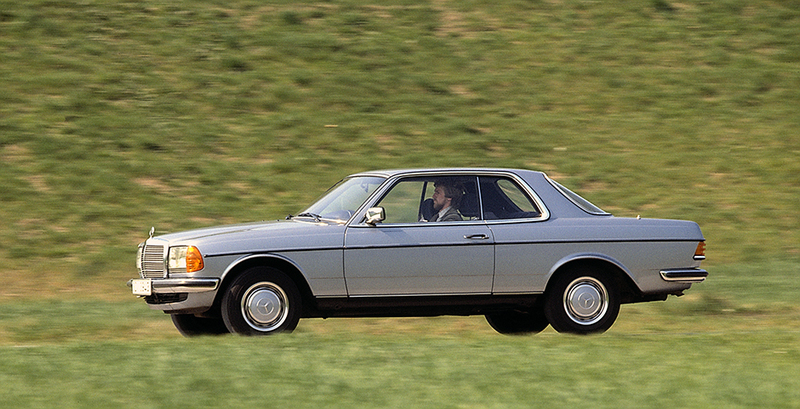 Introduced as a world first in 1978 in the S-Class of model series 116, the anti-lock braking system (ABS) was available on request for all models in model series 123. From January 1982 a further optional extra followed in the form of the driver’s airbag. The engines in models 230 C (2.3-litre displacement, 4 cylinders, 80 kW/109 hp), 280 C and 280 CE (both 2.8-litre displacement and 6 cylinders, 115 kW/156 hp and 130 kW/177 hp). In September 1977 the diesel variant 300 CD (5 cylinders, 59 kW/80 hp) joined them, and was only intended for export to North America. The aim of this model was to cut “fleet consumption”, the average consumption of all Mercedes-Benz models offered in the USA. In August 1981 the 300 CD was replaced by the 300 CD turbodiesel (92 kW/125 hp), reserved, as before, for export to North America. A year earlier the carburettor models 230 C and 280 C for all markets had already been taken out of the range. New at the time was the 230 CE with mechanically controlled petrol injection and 100 kW/136 hp, which consumed less fuel with 25 percent more output. A Mercedes-Benz coupé impresses above all with its high aesthetic appeal and elegance. How did the 1983 flyer describe the 230 CE and 280 CE models? “The body shape of the Mercedes coupé displays timeless sporty elegance. No frills, no short-term fashions. Its flowing line catches the eye and yet is integrated into the car’s overall look with the utmost harmony and effortlessness.” The quotation sums up a fundamental factor in the success of the coupés in model series 123. Great article. My father has a 1979 300CD in that same blue color that’s in the 1981 photo. He purchased it in 1980. The engine started knocking so it’s been parked for 20 years. I am looking into restoring it. Loved this article. The Mercedes Benz W123 coupes have always been a favorite of mine. Absolutely beautiful machines. Timeless classic. Thanks for sharing.